Santanadactylus (meaning "Santana Formation finger") was a genus of pterodactyloid pterosaur from the Albian-age Romualdo Member of the Upper Cretaceous Santana Formation, of Barra do Jardim, Araripe Plateau, Ceará Province, Brazil. Four species have been named, but today it is doubted they are part of the same genus. It was a rather large pterosaur. The genus was named in 1980 by the Dutch paleontologist Paul de Buisonjé. The type species is S. brasilensis, the specific name referring to Brazil. It is based on holotype UvA M 4894 (Geological Institute of the University of Amsterdam), an upper part of the right humerus and a right scapulacoracoid; other remains were also included in the genus: this paratype consisted of two cervical vertebrae from a different individual, referred because they were found in the same lot of 25 chalk nodules bought from collectors. Additional remains, including a notarium (fused vertebrae supporting the shoulder) have been referred to it since then. The structure of the humerus suggests an ornithocheirid, but the long neck vertebrae argue against this. In 1985, Peter Wellnhofer, a German paleontologist who has written numerous scientific publications on pterosaurs, named three additional species: S. araripensis, S. pricei, and S. spixi. S. araripensis, named after the Araripe Plateau, was a large species based on BSP 1982 I 89, remains including a partial skull (missing the end of the jaws) and arms; the preserved skull section had no crest. S. pricei, named after Llewellyn Ivor Price, was the smallest of the three species; it was based on BSP 1980 I 122, a left wing from the elbow down, and additional arm material has been referred to it over the years. S. spixi, intermediate in size, was based on BSP 1980 I 121, another left wing, the name honouring Johann Baptist von Spix. Over the years, the species of this taxon have been reassessed. Chris Bennett suggested that S. brasilensis was a chimera of a pteranodontid and something else (in that the holotype and paratype belonged to different forms), S. araripensis and S. pricei were pteranodontids, and S. spixi was a dsungaripterid. Wellnhofer removed S. spixi from the genus as well, in 1991. In 1992, Alexander Kellner and Diogenes de Almeida Campos suggested that S. spixi was a tapejarid; David Unwin in 2003 thought that "Santanadactylus" spixi was a species of Tupuxuara. Kellner in 1990 renamed S. araripensis to Anhanguera araripensis, followed by Wang and colleagues in 2008, though Veldmeijer (2003) included it in Coloborhynchus. Recent study, however, considers S. araripensis dubious. Also the phylogeny is contentious. De Buisonjé first placed the genus into the Criorhynchidae. Wellnhofer considered it a member of the Ornithocheiridae. 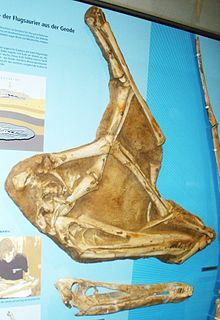 According to Bennett S. brasilensis belonged to Pteranodontidae sensu Bennett. Kellner, concluding that he could find but a single autapomorphy for Santanadactylus brasilensis, the straight ventral margin of the proximal part of the deltopectoral crest, at first thought no greater precision was possible than a Pterodactyloidae incertae sedis, but in 2000 narrowed it down to a Pteranodontoidea sensu Kellner. S. pricei according to Kellner belonged to a clade descending from the last common ancestor of Istiodactylus and the Anhangueridae. The same was in his analysis true for Araripesaurus, a genus of which he had previously thought S. pricei was a junior synonym. Santanadactylus is regarded as a large pterosaur, Wellnhofer for the various species indicating a wingspan of 2.9–5.7 m (9.5–18.7 ft). De Buisonjé thought Santanadactylus brasilensis had a wingspan of six metres. It may have been adapted for gliding over flapping flight. ^ De Buisonjé, P.H. (1980). Santanadactylus brasilensis nov.gen. nov.sp. a longnecked, large pterosaur from the Aptian of Brazil. Proceedings of the Koninklijke Nederlandse Akademie van Wetenschappen B 83(2):145-172. ^ Wellnhofer, P., Buffetaut, E., and Gigase, P. (1983). A pterosaurian notarium from the Lower Cretaceous of Brazil. Paläontologische Zeitschrift 57147-157. ^ a b Wellnhofer, Peter (1996) . The Illustrated Encyclopedia of Pterosaurs. New York: Barnes and Noble Books. p. 124. ISBN 978-0-7607-0154-6. ^ Bennett, S.C. (1989). A pteranodontid pterosaur from the Early Cretaceous of Peru, with comments on the relationships of Cretaceous pterosaurs. Journal of Paleontology 63:669-677. ^ Kellner, A.W.A., and Campos, D. de A. (1992), A new tapejarid from the Santana Formation (Lower Cretaceous) from the Araripe Basin, Northeastern Brasil. Journal of Vertebrate Paleontology 12(Supplement to 3):36–37A. ^ Glut, D.F. (2006). Santanadactylus In: Glut, D.F. Dinosaurs: The Encyclopedia. Supplement 4. McFarland & Company, Inc.:Jefferson, North Carolina, 628-629. ISBN 0-7864-2295-5.